Hornbeam Leaved Melochia is a shrub or undershrubs with leaves alternate, broadly ovate or ovate-lanceshaped, heart-shaped at base, sawtoothed at margin, tapering at tip, 3-16.5x 0.75-7 cm, sparsely velvet-hairy on both surfaces; stipules lanceshaped, velvet-hairy. Leaves are very much like those of Hornbeam trees. 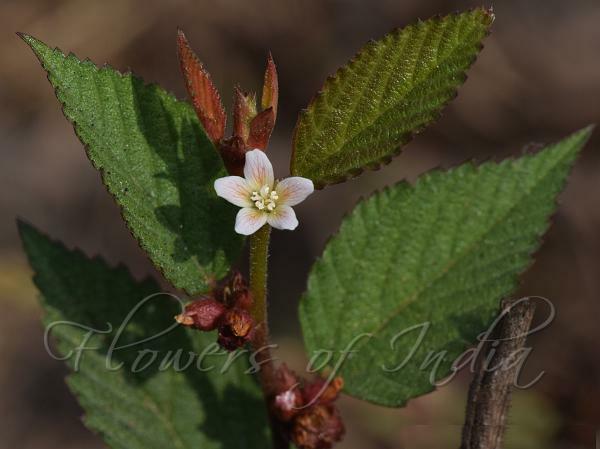 Flowers are borne in a cluster of 3-15, in leaf-axils; bracts ovate-lanceshaped, leaf-like. Sepals fused up to the basal half, ovate-lanceshaped, tapering, 2-3 x 1-1.5 mm, sparsely velvet-hairy. Petals spoon-shaped, 3-4 x 1.5-2 mm, white with purple nerves. Staminal tube about 2.5 mm long; anthers extrorse. Ovary 3.5-4 mm long, bristly; styles 5, free or slightly fused at base. Capsules subspherical, longitudinally 5-grooved, bristly, reddish when young; seeds 3-gonous, brown with a white spot at tip. 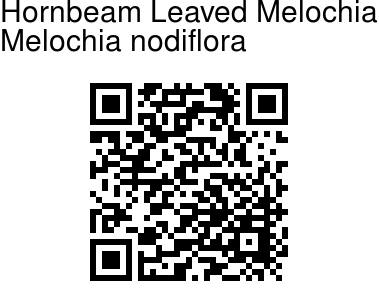 Hornbeam Leaved Melochia is found in South India. Flowering: November-December. Identification credit: S. Kasim Photographed at Kannamangalam village, Vellore distt., Tamil Nadu.